Tuesday August 9th 1898 I was busy most of the forenoon getting things ready to take up home. We had an early dinner and I stopped in town before going over the river. Aunt Fanny Hepburn came today. Mother showed me a letter telling that Uncle George Corwin died out at Colorado Springs where he was visiting at Matties on the 2nd of this month. Wednesday August 10th 1898 We washed this morning and before two oclock had done up the dinner dishes and picked and dressed eight chickens. I sewed a little in the afternoon and was down to Callie's a little while. 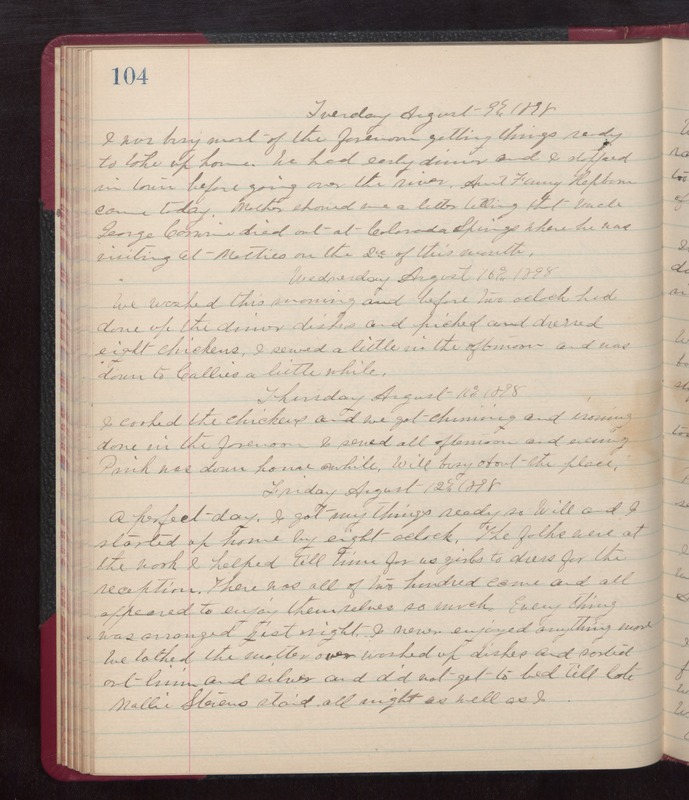 Thursday August 11th 1898 I cooked the chickens and we got churning and ironing done in the forenoon. I sewed all afternoon and evening. Pink was down home awhile. Will busy about the place. Friday August 12th 1898 A perfect day. I got my things ready so Will and I started up home by eight oclock. The folks were at the work. I helped till time for us girls to dress for the reception. There was all of two hundred come and all appeared to enjoy themselves so much. Every thing was arranged jist right. I never enjoyed anything more. We talked the matter over, washed up dishes and sorted out linen and silver and did not get to bed till late. Mollie Stevens staid all night as well as I.